Stonehenge, Avebury and Associated Sites are among the most important groups of prehistoric megalithic monuments in the world. They were constructed between c. 3700 and 1600 BC. They provide insight into the funerary and ceremonial practices in Britain in the Neolithic and Bronze Age. Stonehenge (ca. 2600-2400 BC) holds the most architecturally sophisticated prehistoric stone circle in the world. Avebury (ca. 2600 BC) is a Neolithic henge monument containing three prehistoric stone circles, one of which is the largest in the world. The other two are situated inside the outer circle. Silbury Hill, the largest prehistoric mound in Europe. Its original purpose is under debate. The Sanctuary, which held six concentric rings of timber erected around 3000 BC and two concentric stone circles of ca. 2100 BC. At the parking lot I bumped into a bunch of modern Druids. A cross-section of British society (old, young, men, women, white, black) were putting on white gowns that resembled bedsheets. On this day of the year, 22nd of June, they held their annual rituals at Stonehenge. Earlier I walked round the ancient stones myself. Well, in the company of at least 150 other people. And with about 50 people staring from behing the fence, not wanting to pay the entrance fee: this is a major tourist destination. What can I remark about the site itself? It's just like you see at the innumerous pictures that exist of it. A somewhat mysterious circle of prehistoric stone slabs. To get a grip on what you see you'd have to do some serious background reading and imagening. March 2018. Me and my wife finaly wanted to visit England with all its majesctic world heritage sites.It was snowing in London when we were arriving and the first day trip in our caravan was kind of an adventure. We arrived in Stoone Henge 9 am. The Parking lot was still closed and we were told, that Stoneheneg might not open due to severe snow. It took them another 2 hours to finally open the parking lot and another 30min that we could enter the bus to the actual Stonecircle. Interesting to see Stonehenge in snow, but I always thought it was way bigger and overwhelming than in reality. However we bought the National Trust vistor pass just for visiting this site, so luckily we got in and saw it in the morning. I visited Stonehenge (and its sister site, Avebury) in May 2017 after the new carpark and visitor's centre were opened. The car park is now about one mile distant from the actual stones, and you need to get a shuttle bus from the visitor's centre to the site. The buses are quite regular so the system works pretty well. Given the expensive price, many people will tell you that you can just look over the fence from the next field for free, and they're right. However, I wouldn't recommend this since: a) you can only see it from one angle, ticket holders can see from 360 degrees at varying angles, and b) you won't really get a clear view since there will always be people in front of you. With that said, I think Avebury is probably a better and more interesting site than Stonehenge. Not quite as impressive, but the circle is bigger and you can still interact with the stones (at Stonehenge you're now about 3 metres away at the closest point). One of the world's most iconic and recognizable sites, Stonehenge is a must-see on any traveller's itinerary of England. Of course, seeing the real thing can often a bit disappointing...It's not that the site, with all its associated history, theories and legends, is not fascinating, but somehow I always imagined it a bit larger than it actually is. Of course, it is also fenced off these days, and you can only walk around it. There is currently a large project going on to restore the surroundings almost to their original state, by removing the nearby road and the old visitor centre, and by building a new one quite far away - shuttle buses will be offered to connect it to the site. The other problem is that on any given day, Stonehenge is completely crowded, which means that arriving early will give you an advantage here. There don't seem to be good public transport connections, but there are lots of organized excursions offered. The drive from London takes at least 2 hours, but if you arrive at about 9, there will still be few other people around. This changes only at around 10.30 or so. I can recommend the guided tours by International Friends - their day trip wasn't too cheap, but very well organized and quite interesting. It not only included Salisbury Cathedral and the historic site of Old Sarum, but also a visit to Avebury, which is the second part of the WH site. This is a quaint little village which features a large variety of standing stones similar to Stonehenge. The difference is that you can walk among them and actually touch them. At the end of the trip, we passed by the huge prehistoric mound of Silbury Hill. 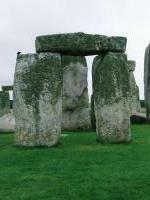 I visited Wiltshire in 2004 and in 2007. In 2004 I was staying in Aylesbury, Northwest of London. I drove down to Stonehenge skirting past Oxford and into Marlborough, a very nice little village on the way to both Avebury Henge and Stonehenge. Also near Marlborough are Silbury Hill, the oldest and largest "burial mound" in all of the UK and Europe, and West Kennett Longbarrow. The latter requires a walk up a modest sized hill however once you arrive the views of the surrounding countryside are just magnigicant. 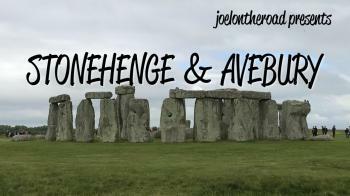 Continue your drive down the A345 and continue on the A303 to Stonehenge, you won't be disapointed. 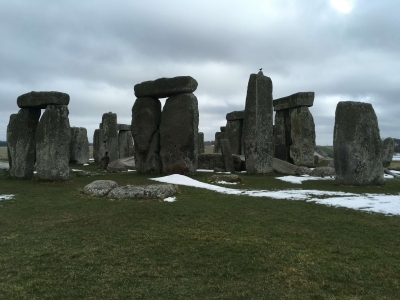 Its truly a magnificant site and the walking tour around the henge is fantastic, be sure to use the portable telephone system as part of the tour. It explains the history of the area. Wiltshire is one of the very best places I have ever been to. Another interesting site to visit if you are in the Stonehenge area : the Bulford Kiwi (not the pub). On a hill overlooking Bulford is a giant carving in chalk of a kiwi. It was carved in 1919 by New Zealand troops awaiting repatriation home. I understand it is cared for by a local boy scout troop. I've always wanted to see Stonehenge and was glad to get the chance. I saw it and Bath in the same day. We made it in the late afternoon to the site. A storm was approaching and it made the sky a fantastic background. People so often forget that Avebury and its surrounding area is part of this WHS listing, that I will concentrate upon the Avebury group - which incedentley is my favourite WHS. The village of Avebury sits largely within the biggest of all stone circles, and as such has a somewhat 'New Age' feel; I once witnessed a child who had picked up a biggish stick (as children do) being instructed by his mother to go and thank a rather large tree for its gift! But it takes all sorts, indeed it was a marmalade magnate called Keiller who is largely responsible for restoring the circle to wahr we see today. Outside of the circle lie other monuments and to get the best from a visit one should spend a couple of hours walking. Starting from the circle walk down West Kennet Avenue, to the Sanctury (the site of a now vanished stone circle, marked by concrete posts), from there make your way to West Kennet Long Barrow, and finally down the hill to Silbury Hill before returning to Avebury. One last reminisance. The first time I took my friend Deirdre here, we were siting quietly backs against one of the larger stones as the sun started to set. 'It feels magical, here dosen't it.' I stated. 'There's no such thing.' Deirdre replied. Stonehenge is a place you go to - no matter how many photos you have seen - just to see how it looks in reality right in front of you. It's quite amazing and always inspires the thought "How did an ancient, primitive people manage THAT, in the days before cranes and suchlike?" It's a "must-see this". It gives you far more respect for ancient peoples and their "primitive" technology. Before I came to England, Stonehenge was on top of my list of places I wanted to visit. I was not disappointed. I was quite impressed... to think that some ancient race was so inspired by the position of the sun, unbelievable! And just how did they manage to get stones that size into position...! Such a mystery, amazing! Whilst I should have been studying I decided to go off and do a tour of Wiltshire to include all the features of the UNESCO site. Stonehenge is obviously the main site and is a world famous tourist attraction so was even busy on an overcast Tuesday in February I have never been on a weekend in summer but I guess it can be exceedingly busy! I would strongly recommend actually paying the high amounts of money to get in to the enclosure, I have been a couple of time to just peer through the fence but nothing is quite as good as the first time when I went in had the free audio guide and could see the sheer size of the stones. This is what makes the whole site so impressive so please if you have made the effort to get here it is worth paying to get in! About a kilometre East of here is the site of Woodhenge, which is amusing but not really awe inspiring it is now a series of small concrete bollards in a field, but it does provide a brief talking point and gives a good idea of how these sites were arranged. I also headed about 20km North up to the little village of Avebury (pictured) which actually sits in the middle of a stone circle. Here you can get up close and touch the stones allowing you the chance to fully explore! The circle is much larger than Stonehenge but the stones themselves are smaller. If you have the chance to get here it provides a pleasant alternative to Stonehenge. The area around here is littered with all the classical Southern English things; more stones, giant white horses carved into the chalky hillsides, burial mounds, manmade hills and in the summer crop circles! The best way to get to the sites is to base yourself in Salisbury which has a magnificent Cathedral and bus links hourly to Stonehenge, and less frequent ones to Avebury, if you were just interested in Avebury it is easier to reach it from Swindon just of the M4 to London or the nice market town of Devizes. I visited Stonehenge in late August and was not disappointed. The day was gray and magical with the sun trying to burn through the clouds. It was worth the extra day it took to get there and back. I found the audio guides to be very valuable to learn about the site (free once you purchase your admission ticket). It is definitely worth paying the few pounds to get in and listen to the tour rather than just looking through the fence. I will never forget it. My boyfriend and I stayed in Trowbridge (about an hour away) at a lovely old refurbished farm turned hotel called the Old Manor Hotel. It was absolutely beautiful with gardens and antiques in every room. It was a wonderful experience. I just stayed at the car park at Stonehenge because I needed to go to Heathrow Airport in time. Anyway, I still watched the Stonehenge when I left the car park by the way to airport. I was really impressed by Stonehenge but i can understand why it leavse most people underwhealmed. The stones are huge once you see them up close and the scale of the site is impressive aswell if you look at the whole area not just the bit that most tourists see. The other sites are well worth a visit. Woodhenge!! is not impresive but can make for nice anecdotes especially if coupled with strawhenge and a big bad wolf!! But Avebury just down the road is more impressive you can acctually go up and touch the stones. If you are in the area it is definatly worth a visit to Sailsbury which has an impressive Cathedral, as does nearby Wichester. It's very unfortunate that most people visit this site only to walk around the henge once and then wait for the next coach out of there. There are Saxon burial mounds, forests and footpaths to explore as well. Combine this with a visit to Salisbury cathedral and you've given yourself a crash course in English history. After a long train ride from southern England, reaching Salisbury, I finally reached Stonehedge and was not at all in awe. I did not pay the entrance fee becasue I felt I could get the same result from outside the fence, and I was right. Although it is something that someone should see, I was done in 15 minutes and waited another 30 for my coach back to Salisbury. 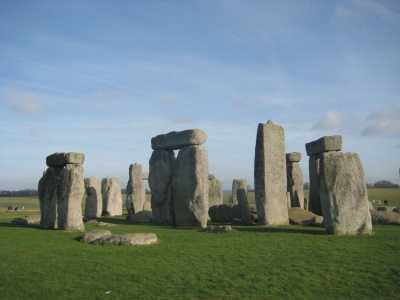 Only a few of the original huge stones are still standing, so it's difficult to say more than Stonehenge consists of huge (twenty-five feet tall, twenty-plus ton) rocks that were put in place 2,000 to 5,000 years ago. When did someone first notice a characteristic that connected the stars, the moon and the position of the sun, with the seasons? How was the information 'recorded' and passed from generation to generation? Did two different groups of people (Stonehenge, and Carnac, France, separated by the English Channel), study the sky, come to the same conclusion, and use huge stones to build astrological installations? Or did members of one civilization cross the channel, and transplant the knowledge that must have taken many generations to perfect? 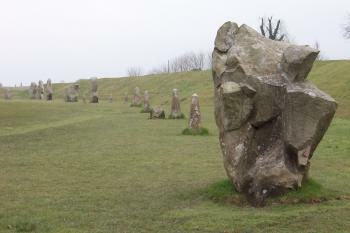 References we have read do not indicate a connection between Carnac's Avenues and the Great Circle at Stonehenge, but the use of huge stones, and the apparent astronomical purpose are certainly similar. Tumuli: Avebury Silbury hill near Avebury (biggest tumulus in Europe), West Kennet Barrow and East Kennet Barrow. Also many smaller ones. Passage of the Sun: "the summer solstice sun rose close to the Heel Stone, and the sun's first rays shone into the centre of the monument between the horseshoe arrangement"
Purpose Built Visitor Centre: In core zone - Due to open Dec 2013. Aurochs: "the platform contained several hoof prints of aurochs"
Bronze Age: This site extends into the Bronze Age. Oldest Buildings: 3700-1600 BC (West Kennet Long Barrow) "Together with inter-related monuments, and their associated landscapes, they demonstrate Neolithic and Bronze Age ceremonial and mortuary practices resulting from around 2000 years of continuous use and monument building between circa 3700 and 1600 BC. As such they represent a unique embodiment of our collective heritage." Astronomy and Astrology: "icon of ancient astronomy"
Charles Darwin: "In 1877 Charles Darwin dabbled in archaeology at the stones, experimenting with the rate at which remains sink into the earth for his book The Formation of Vegetable Mould Through the Action of Worms." Sir William Matthews Flinders Petrie: In 1874 and 1877 Petrie surveyed Stonehenge in detail, and "devised the numbering system for the stones that is still in use today" (See link). Published, at 24, his first book "Stonehenge: Plans, Description, and Theories"
Built elsewhere as a full size replica: Maryhill Washington USA - Full size and to the (assumed) complete design as it would originally have been built. Erected 1918-29 by a local Quaker pacifist businessman as a memorial to local solidiers killed in WWI (which was still in progress when the project commenced). 478 Community Members have visited.